You are most likely to find artist Mike Sluder in welding leathers, elbow-deep in sand or brandishing a blow torch. As one of the country’s notable metal artists, Mike has made a name for himself by creating breathtaking and sophisticated metal art from gritty, industrial beginnings. 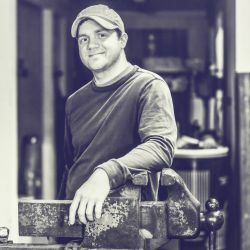 Mike was formally trained in sculpture under internationally recognized artists at East Carolina University, where he earned his B.F A. in 2006. He has worked at two leading fine art bronze foundries, overseeing the Metal Shop and serving as Patina Specialist. Mike currently lives in Atlanta and creates custom art for individual collectors and corporate clients, including The Ritz-Carlton and Hilton Hotel Company. He is best known for his bronze vessels and copper wall hangings, both noted for uniting inspired vision with enduring materials. Mike’s art has been featured in the Museum of Design Atlanta as well as in national and international exhibitions and publications.